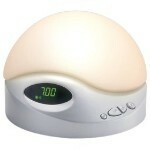 The Pearl SunRise Clock is derived from medical research on light and human behavior. In the early morning, the human biological clock is sensitive to low intensity light. So, waking to a slowly increasing light can result in a smoother, more natural transition to wakefulness. The SunRise Alarm Clock Pearl with White Noise has the ability to set different dawn and dusk cycles of 15, 30, 60 or 90 minutes, adjustable display brightness, fade to nightlight, snooze feature and more. This model has a white noise option that can mask distracting sounds and lull you to sleep faster. It can cover up the sound of street traffic or a snoring roommate. The white noise can be programmed to fade out as the sunset light goes out, or stay on all night. Comes with hand made opal glass globe. One year manufacturer's warranty.